FRANCE: The first utility-scale offshore wind projects will be delayed until 2021 at the earliest, developer EDF Energies Nouvelles (EDF EN) has confirmed. EDF EN director of Marine Renewable Energies, Beatrice Buffon, said the delay is due to legal challenges launched this summer against the projects at St-Nazaire (480MW), Fecamp (498MW) and Courseulles-sur-Mer (450MW). Development permits for the site were awarded to the consortium of EDF EN and Dong Energy (subsequently bought out by Enbridge), alongside WPD Offshore for Fecamp and Courseulles, in 2012. Complaints against the projects cite negative impacts on fishing and tourism, environmental issues and proximity to the D-Day beaches among other things. The court must deliver its verdict within 12 months. "This means a year's delay for the projects," Buffon explained. The consortium now expects to make the final investment decisions in late 2017 or early 2018. 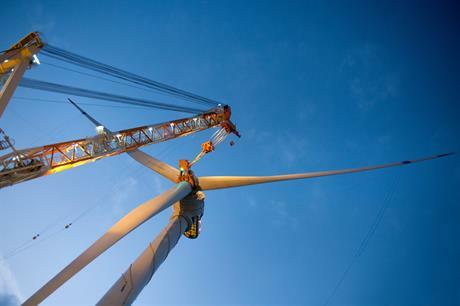 Construction will then take four years, meaning the first turbines will be commissioned in 2021 and the projects completed in 2022, if all goes to plan. The original date for completion was 2020. EDF EN had better news regarding its Provence Grand Large pilot floating project it was awarded earlier this month. EDF EN has been developing the site for several years and is "very confident of securing the permits", Buffon said. The pilot will comprise three Siemens 8MW turbines on tension-leg platforms designed by SBM Offshore and IFP Energies Nouvelles. Buffon expects it to be the first of the four projects to start operating, with installation scheduled for 2020.